There may come a time when your usual coping strategies aren’t working any longer. Life can get on top of us and we need someone to talk to who’s not a friend or family member. As a Psychotherapeutic Counsellor I will give you the space to talk, I will listen and help you to make sense of who you are; how you think; feel and behave so you can enhance your wellbeing. Psychotherapeutic Counselling provides the space to explore your anxieties, relationship issues, work difficulties or whatever it is that’s troubling you. Doing so in a safe, non-judgemental environment with a professional who’s skilled to support you arrive at the answers that are right for you. 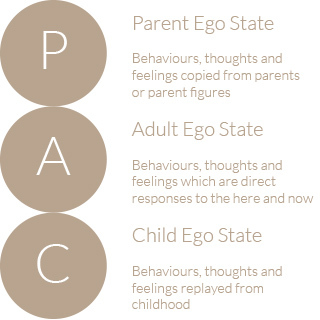 Transactional Analysis was developed by Eric Berne, a psychiatrist, in the 1960s. His philosophy was based on respect and empathic acceptance for all and that ‘I’m OK and you’re OK’. His model identified three ego states: the Parent, Adult and Child. Put simply this enables us to see how our feelings, thoughts and behaviours were learnt and examine how that impacts our day to day being. Moving forward we can explore how your different ego states influence your feelings, thoughts and actions in the present and their impact on how you feel about yourselves and how you are in relationships. As well as a Psychotherapeutic Counselling we also provide Developmental Coaching. The aim of the coaching journey is to work in partnership for 3-6 months, 6 sessions in total. This can be by phone or face to face and sessions are between an hour to an hour and a half, fortnightly or monthly. Sessions cost £65 per session or pre-paid 6 sessions for £350. Why would I see a Coach? Coaching can be used for any area of your life where you would like to make change. Typically people use Coaching for work related stuck-ness, but any area of your life where you can identify a goal can benefit from Coaching. The process will guide you through setting an inspiring goal and moving from your comfort zone through feelings of stretch, fear and risk to achieving your goal and ultimate success. Coaching is a powerful process that supports people to release their true potential and make change in their lives. Offering both support and challenge, it helps clarify what someone is able to achieve, identify their own personal hurdles and overcome the challenges along their chosen path. Coaching is not advising, telling or influencing; and although it might be therapeutic in its effect, it is not therapy or counselling. Coaching is a highly motivational and empowering way of supporting someone to develop themselves whilst providing a framework in which to improve personal leadership and greater individual performance. Coaching takes the form of a series of conversations. These are different to normal conversation as they are more focused, dynamic and are designed to move you forward in your life. It is an interactive process and the Coachee is expected to carry out tasks during sessions.